The holidays are coming up, and that means many good things for us two-leggers: yummy dinners, family time and decorations! While we humans may have a lot of positive associations with the holidays, let’s remember to keep our pets safe during this time. All of the chaos of the season could be a little overwhelming for your dog, so here are some tips to keep their tails wagging from Halloween to New Year’s. October brings chillier temperatures and trick-or-treaters. 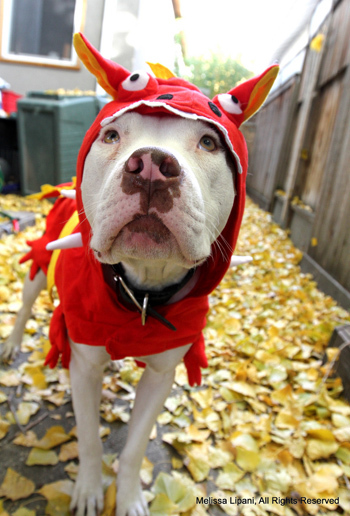 Trick or treating can be nothing short of spooky for your dog. Think about it – the doorbell rings over and over, and lots of witches, monsters and masked people are begging your family for treats (which, might I add, is totally your dog’s job)! With all the openings and closings of the door, your dog might slip out. Make sure your dog has identification tags, and if your dog is micro-chipped, double-check to make sure all of your contact information is current! With all the ghoulish things happening on Halloween, things have the potential to get pretty scary for both you and for your dog. Think about crating your dog during the witching hours (if the crate is a happy place) or keeping him confined to another part of the house, like a bedroom; but avoid locking your dog outside for the duration, which will likely cause additional stress with all the activity in the streets. A fun way to enjoy the evening together is to have some family members curl up on the couch with your dog and a Halloween classic like “Hocus Pocus,” which is our plan for All Hallows’ Eve. Transitioning into Turkey Day means bringing on the food! The period between Halloween and New Year’s are excuses for me to eat all the delicious holiday treats I can get my hands on, but it’s important to remember that many of our favorite treats just aren’t safe for our dogs. Keep that Halloween candy in a safe spot and make sure that your dog doesn’t counter surf to try and take a big lick from your turkey or swipe some stuffing! Rich food can upset sensitive dog tummies, which may result in some unpleasant smells, sounds and trips to the veterinarian, which is never fun. 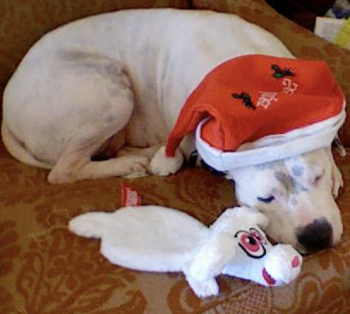 Christmas tree ornaments may just look like balls and toys ripe for the picking to some dogs – same with presents. If you have such a dog, consider putting the tree in a room that can be closed off when the dog is unsupervised or getting a small tree that can be set atop a table. Loud noises can be scary for some dogs – mine included – so on New Year’s we make sure we create a cozy spot where our dog can curl up and feel safe even though there are some unusual things (from a dog’s point of view) happening outside. A chew toy doesn’t hurt either – it provides distraction and gives your dog an outlet for some nervous energy. If chew toys aren’t your dog’s favorite, think stuffed animals or food puzzles. Our dog loves Kongs stuffed with peanut butter and roasted sweet potatoes – freeze those suckers and your dog can be busy for quite awhile! From all of us at StubbyDog, have a safe and happy holiday season!